Barcelona’s Own Silicon Valley: District 22@ is a perfect example of urban renovation that allows for growth in the tech, science and other knowledge-based industries all while preserving the local neighborhood life. 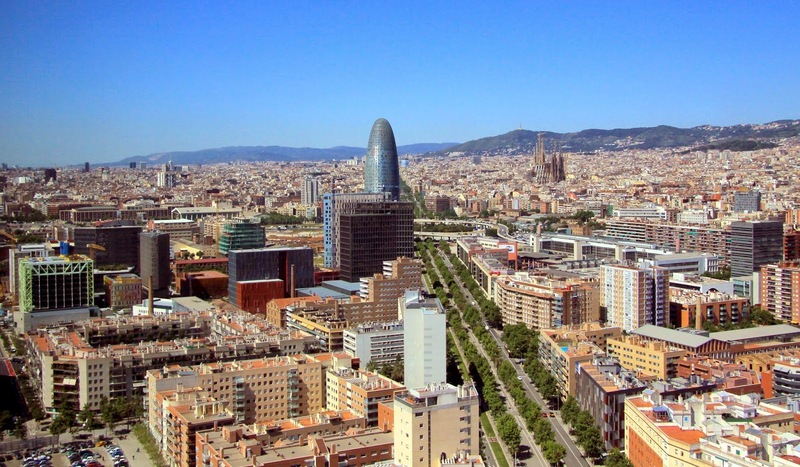 As a follow-up to the article I wrote last year regarding Barcelona’s local tech scene, I thought it appropriate to highlight the district which houses many of these innovative startups and modern enterprises. Many cities have their own tech neighborhoods or areas - New York has Silicon Alley, San Francisco Bay Area has Silicon Valley, Dublin has Silicon Docks - and Barcelona is no exception with its 22@. In line with the idea of transforming and redeveloping a rather industrial and abandoned area of the city known as Poblenou, and backed by 180 million euros of public investment in infrastructure, the 22@ (also known as 22@Barcelona) district is a conglomeration of high-rise residential properties, large shopping complexes, hotels and, you guessed it, new firms. Since its inception in early 2000, it follows the aspiring urban renewal model – both socially and economically. As such, it has brought a lot of advancements to the area by offering present-day corporations of all sizes incentives to help them set up shop and breathe new business life into that zone. 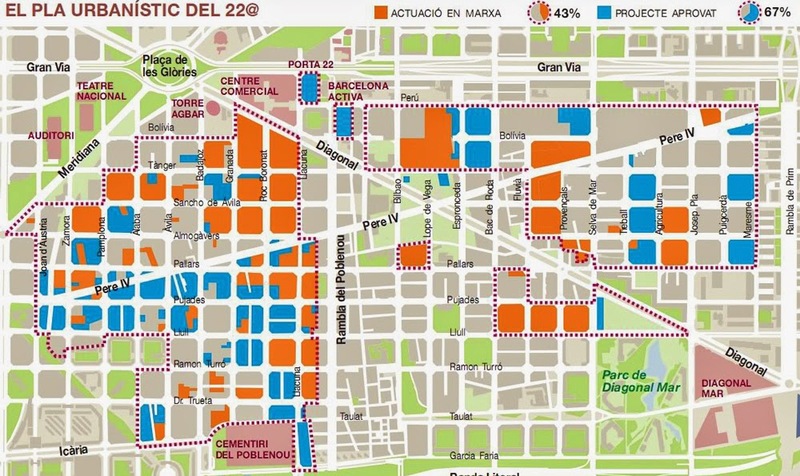 In terms of size, 22@ comprises 200 hectares of industrial land of Poblenou. The local government, faced with the challenge of coping with growing demand by innovative companies looking for a tech hub, and following in the footsteps of other cities around the world embracing urban renovation, found that Poblenou would be the ideal district to accommodate these tech, science and knowledge-based industries. Today the area is home to several startups and larger corporations that have transformed business in the area and by no means in a disruptive way. Rather, they bring high-quality business and employment to the area and in doing so improve the quality of life for most by providing a robust business friendly environment for neighbors that have called the area home for decades. Working class mom and pop restaurants and cafes that once had to struggle to get costumers in the door, don’t have to worry any more as they now have access to thousands of workers that come daily for breakfast, lunch, dinner and client meetings. As one report mentions “22@Barcelona provides a new, high quality, diverse, ecologically efficient and economically strong urban model that strikes a balance between production and neighborhood life.” Moreover, during the early phases of the development, an Industrial Heritage Protection Plan was developed and passed to help new businesses and old neighbors find an agreeable and beneficial coexistence. Ambition has always been a defining factor of Barcelona. As 22@ continues to grow, evolve and thrive, the city and its citizens should benefit from the overall success of this plan that is already well on its way to becoming an proud example and reference-point of new city urban modelling for years to come. Total Planning Area: 198,26 Ha, 115 blocks, 1.159.626 m². Location: The Poblenou area, which lies to the northeast of the city between Vila Olímpica and Plaça de les Glòries and the sector delimited by Avda. Diagonal and the streets Perú and Rambla Prim. Housing: Recognition of the existing 4.614 dwellings. Creation of 4.000 new state-subsidized housing units (minimum 25% rental). New Facilities: 145.000 m² land. New Jobs Generated (estimate): 130.000. Investment in Infrastructure Plan: 180 millions Euros. Increase in Green Spaces: 114.000 m².